Climbed on May 18, 2003. How to get there: The closest local community is Osa. 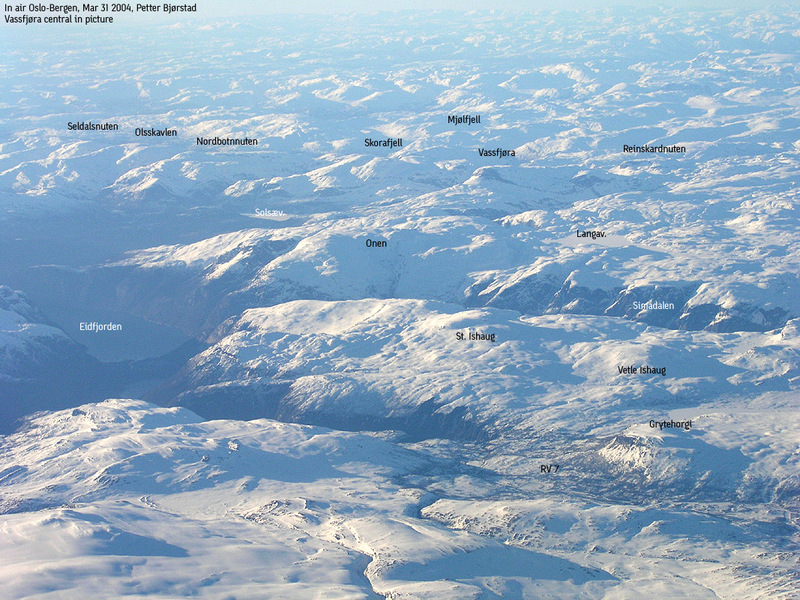 Osa is about 10 km from the village Ulvik. 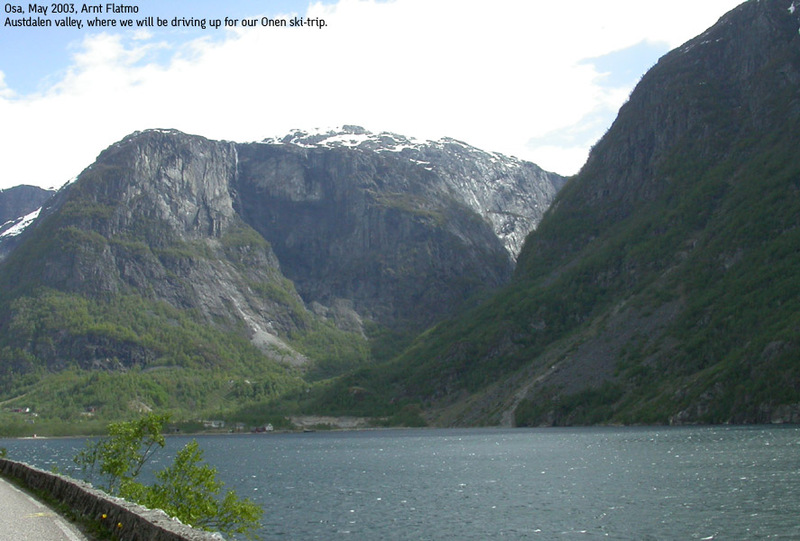 Ulvik is about 2 hours drive from Bergen via Voss or a bit more if you drive along the Hardangerfjord to Granvin. From south and east the ferry connection Brimnes to Bruravik must be used. The road to Osa continues as a toll (30 NOK) road up the narrow valley leading east to Langvatnet. This road may be closed in winter. In the spring, the road is open part of the way, in May we drove to elevation 760 m, just before the road crosses the river. There was good parking at this spot (GPS location N 60:04.766, E 007:05.446). Route description: This description is only based on my trip in May. 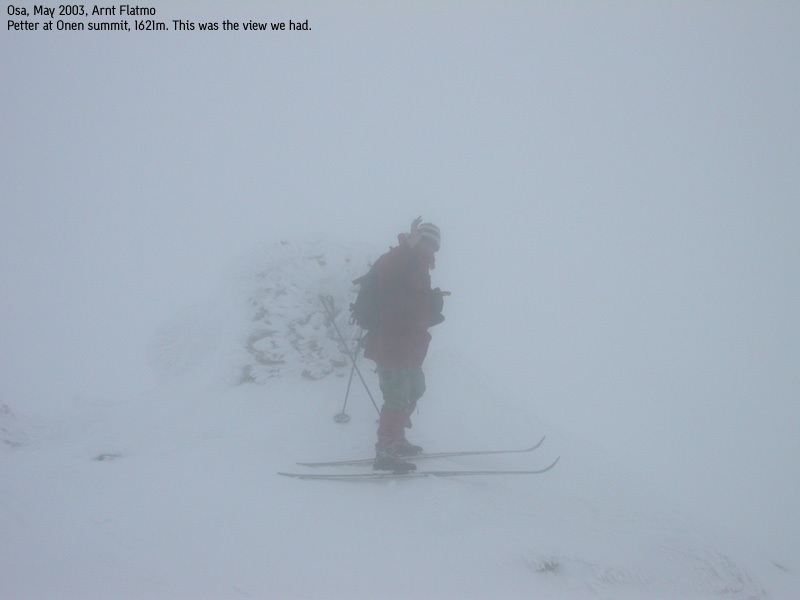 The visibility was near zero on Onen (above 1250m), therefore details may be missing. Hike up the valley along the road until you pass a saddle and the lake Austdølvatnet is visible close to the road on your left (north) side. Leave the road here and climb the valley going south. Be aware of possible avalanche danger in the winter. Regain the road higher up and follow it west until reaching a plateau above 1200m. Instead of following the road (in winter) it may be better to ascend slightly higher to the south, to a point where the power line (on your right) that climbs up from the valley has its last pole. Do not confuse this with the larger power line that you climbed below after leaving the road. Ski south towards the small lake north of Lakjehøgdi where you cross the road. Be aware of possible avalanche conditions in the steeper slopes. There is a gate on the road here, this may be a good place to park in the summer. Continue south up the gentle valley west of Lakjehøgdi and descend to the western bay of Langvatnet. The north ridge of Onen is right in front of you. Continue east of this ridge and ascend a gentle valley, first south, subsequently south-south-west, staying east of the highest ridge. Finally, continue the gentle ascent to south-west and locate the summit cairn. Comments: I did this climb with my friend Arnt Flatmo. We started at 1230, reached the summit at 1645 and returned to the car at 1905. 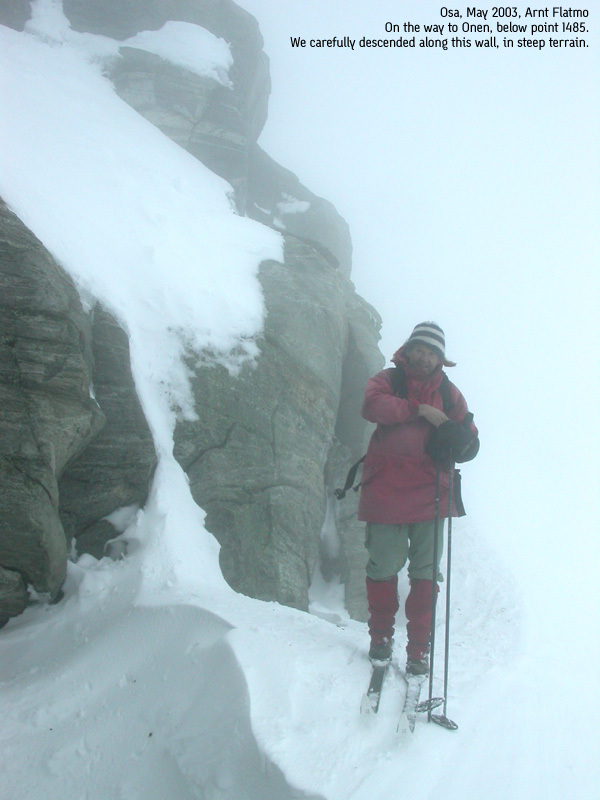 We quickly skied into the clouds and with low visibility, wind and hail the trip took longer than what would be normal. On a clear day, the view from this summit is probably very good, unfortunately we had essentially zero visibility. Onen and nearby mountains as seen from the air. Austdalen, as seen from near Osa. The road climbs up there. Cliffs and fog, never a good combination. We are below point 1485 on the north ridge of Onen. The Onen summit cairn, a "nice" day in May.